Don Yaeger, motivational speaker, keynote speaker, four-time New York Times best-selling author, thrills audiences with his stories as a professional speaker and messages about what makes the great ones great! 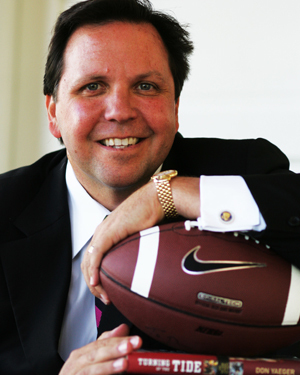 Don Yaeger has witnessed the success stories behind some of the greatest sports figures of our time, and the lessons he’s he shares with audiences all over the world as a motivational speaker and professional speaker, gives the groups the true path to success. Don Yeaeger is one of only 200 authors in the world to have four books on the New York Times Best Seller List. Few can lay claim to as exciting and colorful career as Don. In his 20-plus years as a journalist, he has conducted interviews with some of the greatest athletes of our time – Michael Jordan, Mia Hamm, Emmitt Smith, Serena Williams, Jimmy Connors and countless others. He has lived with Walter Payton, writing the NFL legend’s autobiography as Payton courageously battled cancer, and even interviewed the President of the United States in the Oval Office. A 1984 graduate of Ball State University with degrees in both journalism and history, Yaeger began his career in journalism as a reporter for the San Antonio Light where he rose through the ranks to pen investigative features for the daily. He later moved on to the Dallas Morning News. Following his stint in Dallas, Yaeger worked as a political editor for the Florida Times-Union. He is also a two-time finalist for the National Magazine Award and has been included three times in Best American Sportswriting. After four years, he dedicated himself solely to the pursuit of writing books. Yaeger’s first book, Undue Process: The NCAA’s Injustice For All, was published by Sagamore Publishers in 1990. He has since gone on to write ten other sports-related books and co-authored the highly-publicized New York Times Best-seller, 1998’s Sports Book of Year, Pros & Cons: The Criminals Who Play in the NFL. In the fall of 2000 Don published Never Die Easy, The Autobiography of Walter Payton with Random House. It became a New York Times Best-seller. Recently, his book, Ya Gotta Believe, about the battle baseball legend Tug McGraw fought against cancer also became an instant Times bestseller. After several years of freelancing for SPORTS ILLUSTRATED, Don joined the magazine’s staff full-time in July 1996. Two years, later he was promoted to Associate Editor, where his work was to cover not just sporting events but the legal issues, controversial happenings and major issues affecting the world of sports.